Since my focus and energy has been on PublisherChallenge the past couple months, I thought I’d give an update on what’s new with the site and how it has been performing. 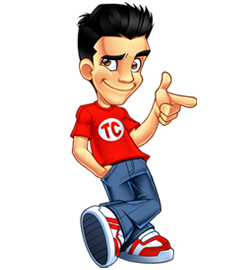 My programmers and I have been busy adding new features and improvements ever since the site launched on February 7th. It’s actually pretty amazing to know that the site is only 5 weeks old as it’s doing very well for such a short time frame. 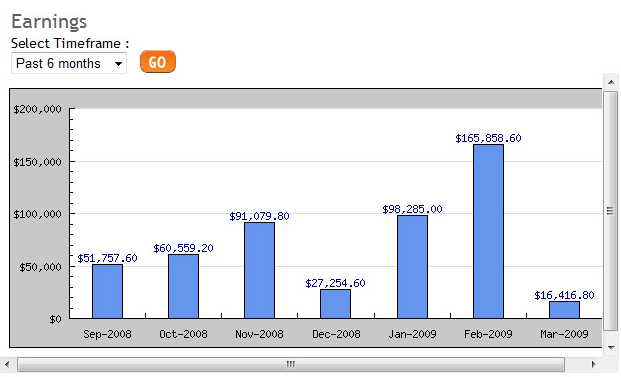 The most significant improvement we’ve implemented was the transition over to a much improved graph and chart system. The new charts and graphs use flash and are animated and interactive. For example, when you hover your mouse over a certain section, the exact corresponding data, such as commissions, will display. Anyone who uses Google Analytics will be familiar with these types of dynamic charts. We also added a new “Earnings by Day” line chart which is a great addition as it shows the day-to-day earnings trend, as well as a pie chart of the network distribution. We also added a dropdown menu for the line chart with both preset values and a date range function to allow users to search for exact daily income by any period of time. The other notable improvement worth mentioning was the expansion of our Site and Publisher Statistics section which is displayed on the site’s left column. In addition to being formatted better, the addition of Yesterday and Today total commissions gives a better overview of how the site is currently doing. The Publisher Statistics section has been redone to display the number of users by site members and individual network. It also displays how many new signups were made during the current month. 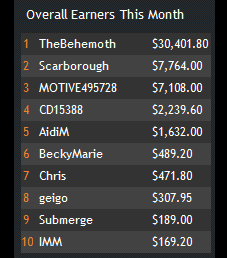 For those that remember, at one point TheBehemoth comprised over 90% of my total referral earnings. This is of course dangerous for the infamous “putting all your eggs in one basket” problem. Fortunately, things have improved lately and the distribution of weight regarding commissions has become much more balanced. While TheBehemoth still accounts for 56% of the total commissions, that number is dropping and things are becoming a lot more stable. This was the first month MotiveInteractive ran a competition on PublisherChallenge, but they’re on pace to have an extraordinarily good launch. Previously, my average first competition with other networks would bring in around $7,000. 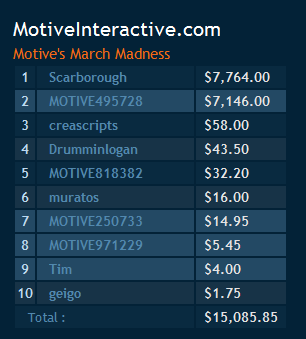 MotiveInteractive, only 12 days in, has already generated $15,085.85 and is on pace to hit $39,000 for the month! That’s a fantastic result. I’m sure many small networks trying to get off the ground would be thrilled to receive an immediate increase of nearly $40,000 per month. It would be nice for word to get out a bit more though and for more networks to be interested in coming on board, but overall I’m happy with how things are going with PublisherChallenge. That is pretty cool. It is nice to be back and reading your Blog again. The cash is rolling in. Nice to hear about the success of the site. Are the charts made in flex as they look like so? The new graphs look awesome. Would be curious like Mega Champ to know which technologies you used to implement them. I was saying Flex as i did some programming for one of my project and it reminded me of the same. It will give you a pretty good experience on what tyler is talking about on charts. It is amazing to see how well your site is doing after it being online for only a month. The new charts do look great by the way. 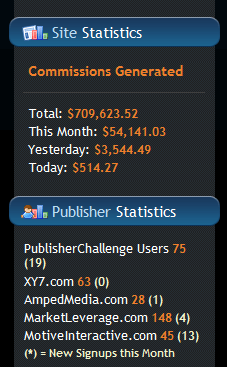 Sorry if this is too personal, but how much have your personal earnings increased as a result of PublisherChallenge? That’s what interests me. Congrats on yet another successful project and good job on all the work you have done, Tyler! Cool well good project. Really informative. It will give us a pretty good experience on what u are talking about on charts. 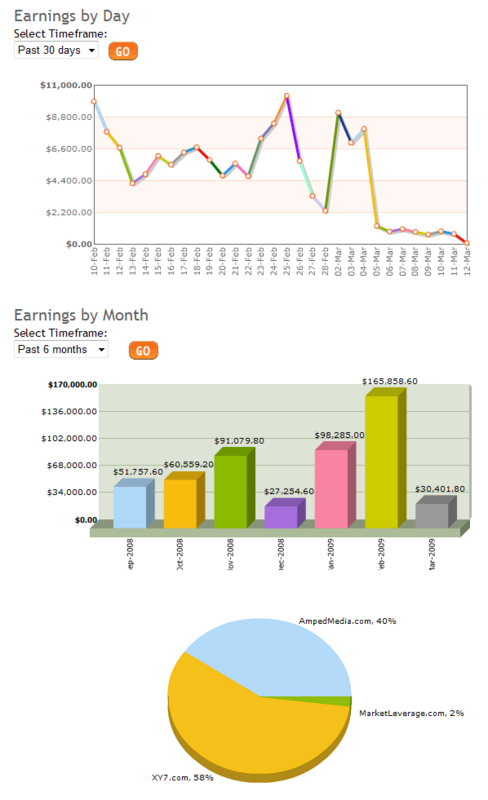 Nice stats mate, alot of cash there I liked how you show’ed how much was getting made daily! Great post. The progress is obviously seen.Your inspiration brings tons of money.Wish you new successes in your projects! Nice job man. Looks like your doing well with your contest. Those india programmers seem to be doing a great job too. Keep up the good work. The graphs look good and you’ve picked a good model in Google Analytics. The only downside of the MotiveInteractive results is they seem very front heavy. Only two of the participants really drive the earnings. Something wrong with all AmpedMedia Commissions? Yes, we are currently working on fixing it. Your stats should be reporting correctly in AmpedMedia – it’s just PublisherChallenge is currently having difficulty parsing the AmpedMedia stats for Feb-March 23rd. New charts looks nice.Thanks for sharing with us.